I'm very fickle when it comes to my choice of toothpaste. I've literally tried every brand/flavor/color/texture out there. I've never had a monogamous relationship with my toothpaste. I'm the Charlie Sheen of the toothpaste industry--I'll put anything into my mouth. Given that I regularly wake up with a half-inch layer of musty fuzz on my tongue, having a strong, effective toothpaste is very important to me. I'm very conscious of my breath and oral hygeine. I'm a floss nazi, and enjoy a nightly water-pik knifing of my gums. I have yet to find a toothpaste that does everything I need. Cause the dentist to utter the following when looking into my mouth. "Damn...that's nice." 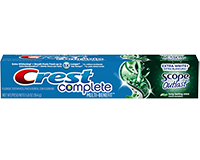 In an attempt to find this ideal toothpaste, I recently picked up Crest Complete Multi-benefit Extra White +Scope Outlast - Lasting Mint toothpaste. That is a minty mouthful. I imagine that to cut costs, Crest fired their entire marketing team. Rather than come up with a clever name for this toothpaste like Frosty Mint or Lightning White, they just listed everything they knew about the toothpaste. I'm surprised they also didn't have "striped mint, paste/gel, tube, for use in mouth" appended to the end of this name. Or maybe they just ran out of room on the box for it. Regardless of Crest's propensity for verbose product names, this is a very good toothpaste. It might even be a keeper. I'm very suspicious of any toothpaste that claims it "whitens." By definition, as you brush your teeth they should be whiter. I usually take these claims with a grain of salt. What I did find to be desirable with this toothpaste, is the strong minty taste. It packs a punch, and instantly gives good breath. Plus, Crest claims that the good breath will last 5x longer due to the "Scope Outlast" portion of the paste. I will concur that the refreshing taste of scope is present long after brushing. In addition, this paste has a good "foam quotient." (Amount of foam created during brushing) The foam holds well in the mouth but doesn't go as far as to give you that Cujo look which inevitably starts dripping on your shirt. This is a solid toothpaste for all ranges of oral needs. If you just need a strong toothpaste to cure your morning dragon breath, or if you enjoy regurgitating your food in order to lose weight (not condoned by this site), this is a good choice to ail your stinky chops. Your friends, family, and casual partners will thank you. I'll be sure to try this out, thank you very much for sharing this dental product. I just so happens that I'm currently looking for a new brand of tooth paste. Thank you very much for sharing.